From the first chapter of Rachel Nightingale’s debut novel, Harlequin’s Riddle, I was immersed in magic and tangled in mystery. This is a book about truth and deception; about masks and what lies beneath them. A troupe of players, colourful and charming, visit Mina’s hometown to stage a performance for the second time in her memory. The last time they visited Andon, Mina’s brother Paolo became one of them: he hasn’t been seen since. Despite a suspicion that her real skills lie in storytelling, Mina can’t give up the opportunity to find out what happened to her brother. When the players leave, she, like her brother, has joined them. Mina’s travelling companions become like family and make up a vibrant cast of characters. Mina is quickly introduced to the player’s art of accessing Tarya, a place of dreams and magic, to transform their acting. She also discovers that the players are considered by some to be practitioners of dark arts. As she seeks her brother, Mina begins to discover the real consequences of the players’ ventures into Tarya. Nightingale’s voice comes alive as Mina’s journey takes her both further from home and deeper into Tarya. We share Mina’s frustration at veiled truths and her suspicion that something rotten is hidden behind the pleasant scenes of the stage. Nightingale is in no hurry to spill her secrets, so we are drawn into these mysteries with leisure. The stakes are raised and we see that Mina is not a feather-weight being carried along by every stray breeze, but is patiently following her own course. She understands that acting is of supreme importance to her fellow players and enjoys the glory of applause in its own right, but she is never completely drawn in. She is willing to pull aside masks and reveal wrongs, even in the face of danger. This raises the question—is this always the right thing to do? And what should she do when revealing the truth will put others in danger? Although she is told that she is “too trusting,” Mina is clever enough to hold her own secrets close while discovering what those around her would like to keep hidden. One facet of the story that troubled me was the reaction (or lack of it) after a player attempted a predatory attack on Mina. There was very little in the way of consequence. Even in the very different societal setting, I felt the attacker was forgiven too soon. However, this book is the first of a trilogy, so this may be more fully resolved in later books. Nightingale’s experience in the theatre, and her research into commedia dell’arte, shine through to bring alluring detail to the art of the players. Commedia dell’arte (comedy of professional artists) is a scriptless form of acting, where the actors each play a set character and improvise dialogue based on a loose plot. 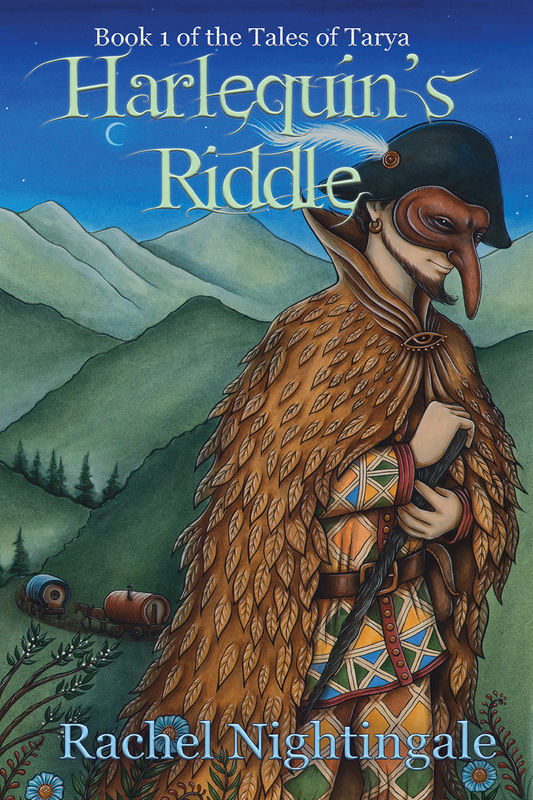 Harlequin’s Riddle is set in a fantasy version of Northern Italy, where commedia dell’arte originated. Nightingale’s descriptions of the unique customs of different districts and countries add texture to the world she’s created. We can see how the traditions and biases of different areas have influenced the backgrounds of the diverse characters, with implications for their views of right and wrong. The strict, overarching laws of Litonya, the country they live and travel in, mean that much of what the players do must remain hidden. This coming of age tale will hit the mark perfectly for its audience of young adults. It left me wanting to know where Mina’s travels will take her, and how she will engage with the evil she’s encountered. I look forward to reading the next book in the trilogy.